Is Africa the Next Big Thing? In recent years, it has been clear to see how changes in the BRIC (Brazil, Russia, India, China) countries have had an effect on the global economic and agricultural sector. The rate at which these countries’ economies grew for much of the last 10 years, was never going to be able to maintained forever, so now is the time when growers/exporters and processors are beginning to look to the future to see what will be the next set of influencers. Added to this, there is still concern over the future of the Euro zone region and the Middle East is still subject to wider geo political tensions. As a result, among those markets being actively considered is Africa, and with good reason. The Continent of Africa itself is huge and made up of 54 diverse countries, with a total population of 1.2 billion currently. The majority of these people are located in Eastern and Western Africa, accounting for over 60% of the total African population - in comparison, China alone has over 1.4 billion people living there. The biggest countries in Africa in terms of population are Nigeria with c. 175 million followed by the likes of Egypt and Ethiopia, both with over 80 million and then South Africa with 53 million and Tanzania with some 44 million. What is of real importance however is the fact that this overall figure is set to almost double, to reach 2.4 billion people by 2050, according to the International Monetary Fund (IMF). As well as increasing population numbers, there has been a clear rise in the strength of the middle class, doubling in numbers between 1990 and 2010 to over 320 million. By 2030, half of the people that live in Sub Saharan Africa will be living in cities. This rise has come about as a result of a booming manufacturing and service sector which has led to less dependence on more variable natural resources and the rural economy. This boost to the economy encouraged the IMF to increase their forecasted GDP rate for 2015 to 5.8% from 2014’s 5.4%. Internet penetration (a clear indicator of an economy’s development) within Africa is growing with 240 million people online at present, however, the uniformity of this is questionable. Rates differ across countries, and rise to the highest levels in Cape Verde (38%), Kenya (47%) and South Africa (49%). The retail sector has taken note of this growing sector and have started to develop online and digital retail offerings for customers. Global retail players Carrefour and Casino announced plans to expand their online presence in Africa in order to keep pace with domestic operations doing the same. The growth of both local and international supermarket chains in Africa is starting to see the development of far better opportunities for the world’s leading produce suppliers and will see the demand for higher quality fruit and vegetables stimulated. Within the agricultural sector, Africa has a number of leading fruit and vegetable producing countries. Within the vegetable sector, Egypt is the largest African grower, accounting for 25% of all vegetable production, equivalent to c. 20 million tonnes of produce. Behind this Nigeria and Algeria account for 16% and 9% of supplies respectively. Although fruit growing remains an important industry within Africa (the leading players: Nigeria, Egypt, Uganda, South Africa and Cameroon contribute to the 95 million tonnes produced annually) with the main products being grown including plantain, bananas, a range of citrus, mango, pineapple and grapes - vegetable production is just as strong. Around 60 million vegetables are produced each year in Africa, with onions the leading vegetable grown across the Continent, equating to 10 million tonnes. Production of cabbages, chillies, peppers and okra are also key for Africa, with exports of these vegetables being exported mainly to the EU and Middle East as well as for the local markets. 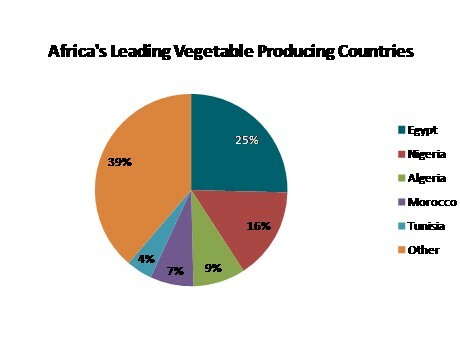 However production volumes vary across Africa, with the leading ten countries accounting for 80% of total vegetable production in Africa. Despite the economic growth and achievements of many African countries over recent years, it still remains difficult for the Continent to shake off its negative historic war torn and politically troubled image. In 2015, five African countries (Somalia, Nigeria, Sudan, Central African Republic and Libya) accounted for half of the top 10 global countries which suffered from extreme political risk. This is where the challenge exists for those looking to work with and develop African business opportunities in the future. Non tariff barriers such as poor enforcement of business standards also exist in Africa, however, the extent of their existence is variable amongst the 54 countries. Overall, Africa’s position on the global market as both a producer/exporter and now maybe as an import market too, is having a stronger impact than in the past. Imports of fruit are increasing – for example, imports of apples have increased from around 100,000 tonnes to almost 500,000 tonnes in the last 10 years, with suppliers such as South Africa, some of the European countries, China and Turkey as well as Chile all eagerly assessing the market opportunity. The developing economic situation across Africa indicates that the historic scenario of poor consumers and high risk markets is beginning to change. Coupled with a boost in population numbers, a rising middle class and greater impact from the service and manufacturing sectors indicates that this Continent is going places. However, it is not yet fully developed and political instability across the region will continue to negatively affect the progression of the market in the short term. For those that are considering doing business with Africa, it is not going to be an easy ride (at least, not in the short term), but with the issues on some other world markets, Africa, based on a massive increase in population and many more wealthy consumers than in the past, now has to be bought into the overall equation and part of the long term international marketing plan. If it was easy, it would mean that Africa would already be the next big thing. 2019-04-24 "South African yellow kiwi season timed perfectly between the European, New Zealand rush"